This is your opportunity to purchase high quality ESC produced by Yokomo for Drifters!!! Comes with loads of features which are designed for drift use. Although, depending on set up you can easily use for your racing as well. 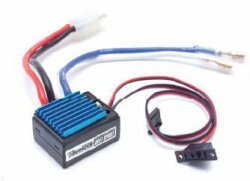 Power source: Ni-cd/Ni-mh 6-7 Cell 7.2V-8.4V, Lipo: 2 cell.